When Chicago Mayor Rahm Emanuel stated last fall that he would not be a candidate in the upcoming mayoral election, the political door opened for a wide range of candidates seeking the office and a wider range of policy proposals to address important issues for the city. As mayor of the 3rd largest city in the United States, the winner will face challenging problems from paying pension benefits to addressing safety concerns to K-12 school performance. One critical issue may impact all of the social issues: economic growth. Without economic growth and opportunities, Chicago will be unable to pay for new social programs, and will likely see additional loss of population, which will put additional pressure on city finances. As a quick reminder, Chicago owes $28 billion to the retirement systems for schoolteachers, police officers, firefighters, and other city workers. 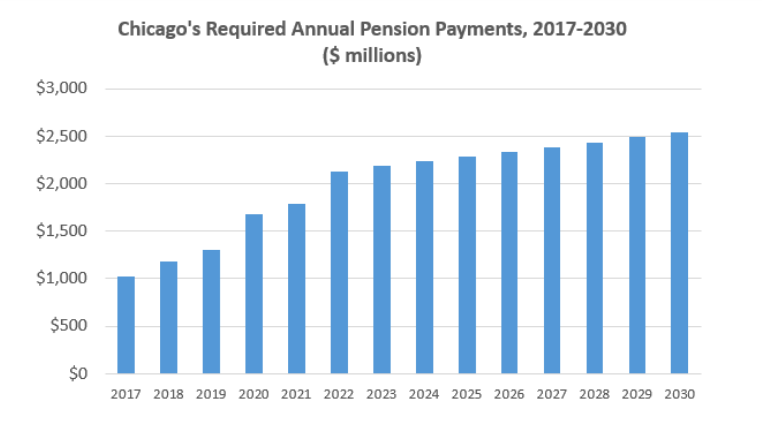 The chart below shows the city’s required annual pension payments; which are scheduled to increase over the next four years by more than $1 billion. This will take up approximately more than 20% of the entire Chicago city budget(1). With this in mind, let’s review the plans of the runoff candidates, Toni Preckwinkle and Lori Lightfoot, for their policy proposals to create economic and job growth for Chicago. On taxes and revenue, Preckwinkle, “supports passing a tax reform package that included progressive revenue that will allow the state to stabilize the pension debt systems and reduce the growth so that Illinois can afford to live up to its obligation to properly fund our schools.” This is the same constitutional tax reform package that Gov. Pritzker announced during his state of Illinois speech that would change individual income tax rates from a flat structure to a progressive structure and would require a constitutional amendment. She doesn’t support a constitutional amendment to change Chicago pension liabilities for current city employees or retirees. Preckwinkle supports a casino in Chicago, legalizing and taxing recreational marijuana, and a real estate transfer tax on properties sold for over $1 million. $4 million and to recruit the private sector to match it. Finally, Preckwinkle wants to reform the Neighborhood Opportunity Fund (NOF) to increase applications, change the payment structure and widen the types of investments. On taxes and revenue, Lightfoot, “I support a progressive state income tax.” (3) Like Preckwinkle, Lightfoot supports the same constitutional tax reform package that Gov. Pritzker announced during his state of Illinois speech that would change individual income tax rates from a flat structure to a progressive structure and would require a constitutional amendment. Like Preckwinkle, she is against amending the Illinois Constitution to reduce or diminish pension benefits for current city employees or retirees. Lightfoot supports a casino in Chicago, legalizing and taxing recreational marijuana, and a graduated real estate transfer tax increase. On transportation infrastructure, Preckwinkle and Lightfoot have similar programs to improve Chicago. (5) Lightfoot has proposed an extensive transit program with 7 priorities listed. (6) Although Preckwinkle doesn’t have a formal proposal,she has commented on these issues. As of this writing, neither candidate has expressed their views on Mayor Emanuel’s $8.5 billion O’Hare expansion project scheduled to open in 2028. Underground express transit link to O’Hare: neither have embraced Elon Musk’s $1 billion plan. CTA expansion: both support Red Line expansion from 95th to 130th Street. Safer Streets: both support building 100 miles of bike lanes in Chicago, including 50 miles of protected bike lanes. Ride-share taxes: both support the current tax on ride-share to help fund transit. Wrapping this up, it’s fascinating to see the candidates’ proposals across many key topics on both job and economic growth. There are differences to be sure, but both have similar policy proposals to solve the issues on infrastructure, O’Hare, and talent. The challenge for the next Chicago mayor is to balance growing the economy with creating revenue streams to pay for infrastructure, education, and pensions.